The Classics Club Spin Spun Me ‘Black Narcissus’ …. …. and I couldn’t be more pleased. I fell in love with the cinema adaptation of ‘Black Narcissus’ – by Michael Powell and Emeric Pressburger – many years ago, but it was only a few years ago that I noticed Rumer Godden’s name among the credits, and realised that the book that had been adapted was written by an author whose works for children I had loved. 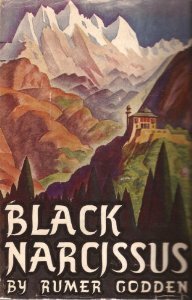 ‘Black Narcissus’ was Rumer Godden’s third novel and her first best-seller. Sister Clodagh was to lead the community; Sister Philippa was to manage the gardens; Sister Briony was to run the dispensary; Sister Honey was to teach the local young women to make lace; and Sister Ruth was to give lessons to the younger children. It was a wonderful plan, but nobody was interested; nobody came. Mr Dean, the general’s agent, an Englishman gone native, offered practical help that the sisters accepted, and sensible advice that they did not. The altitude, the isolation, the unemployment, began to affect the sisters. One dreamed of motherhood; one longed for romantic love; one dwelt her life as a young woman, before she took her vows; and one realised that an interest was turning into an obsession. But as the nuns fell in love with the strange beauty of their surroundings, with the village children whose families were paid by Mr Dean to send them to school, with Mr Dean himself, they began to fall out with each other. Long buried emotions had come to the surface. Sister Clodagh lacked the experience, and maybe the understanding to manage the situation. And, of course, there were consequences …. Rumer Godden sets out every detail. She is subtle, gentle, but she makes it clear that everything that happens is inevitable. It comes from the characters, their situations, their emotions. There is a wonderful depth to the women, their relationships, their stories, and yet the narrative feels simple, natural and it is utterly compelling. There is little plot: a young man is allowed too close to a young woman; a sick child is brought to the nuns; one sister leaves and another snaps …. But it is enough to move the story forward while keeping the focus on the members of the community, and their lives. The prose is lovely, the atmosphere and the descriptions are gorgeous. But there was enough space for me to realise that this wasn’t just the story of a group of nuns; it was the story of the British in India. The book and the film are very different pleasures – the book is gentle and absorbing; the film is striking and melodramatic – I wish I could have read the book without knowing what would happen, but it didn’t really matter, because the book held me in the moment from start to finish, and I didn’t pull away remembering that I knew what would happen once. I would have liked to now a little more about each woman, but this is a very short – maybe too short – novel. But sometimes it’s best to be left wondering. And I’m so curious now to see how Rumer Godden grew as writer with the many books she wrote after this very early novel. Which book should I read next …. ? « An A to Z as I may be more absent than present for a while …. Oh, Jane, Black Narcissus was my first Godden too, and I was hooked after it. I also love Kingfishers Catch Fire, which makes use of some of her real experiences living alone with her children in an isolated house in Kashmir, and An Episode of Sparrows, set just after WWII. She had such a fascinating and sometimes harrowing life, too (and writes beautifully about it in her memoirs). You didn’t expect just ONE recommendation, did you?! It was my first too. I’ve read just one other only because that was the only one I could find. Such a prolific writer so there is a lot around. Apart from the colonial India aspect, I do so like the descriptiveness of it all. Oh my goodness it’s years since I read Black Narcissus, it was one of the set books for our English CSC exam. Don’t think they do CSCs any more, so that’s dating me! I wonder if I’ve got a copy, will have a look round the shelves, and if not, then I’ll try the library. I haven’t heard of this one before, it sounds so good. Thanks for the great review. I haven’t read this one yet, but I fell in love with Rumer Godden’s books over another convent, In This House of Brede. It’s still my favorite of her novels, but I also love China Court. And her two volumes of autobiographies are both very good – I’ve been meaning to re-read them. What an unusual book. It sounds quite fascinating. Thanks for the great review! As you say, she is a writer with very varied settings for her novels. My particular favourite is ‘The Greengage Summer’, a coming of age story set shortly after the war, about children on a French holiday who are left to their own devices when their mother becomes ill. I have this tbr and I am looking forward to it, I have so loved the other Rumer Godden novels I have read. Breakfast with the Nikolides is great, as is Kingfishers catch Fire, The Greengage summer and The River. Have you read The Greengage Summer? It’s pretty wonderful, too. Loved the dress called Sin!